← in the redwood forest. Last time I visited Chicago, it was solely for work. This time around, Gloria had a work conference to attend. The opportunist in me thought it would be fun to tag along. In the short time that we were there, we actually got to see a lot of the city. On the first day, we crossed off a handful on our “places to visit” list. We started off by walking South from the Magnificent Mile area towards the Willis Tower. One of the coolest sights to see in Chicago, at least in my opinion, is the abundance of bridges over the Chicago River. It’s neat to see beautiful architecture and big skyscrapers right along a river. We spent a good amount of time just enjoying the views from the 103rd floor. 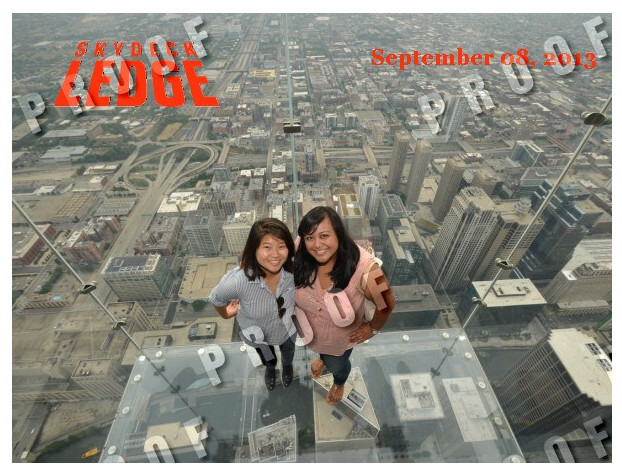 To be quite honest, we spent a lot of time up there playing on the Skydeck glass ledge! What’s that, you ask?! Well, it’s basically a glass ledge that extends off of the building, and it’s made of glass on all sides, including the floor. You can stand on the ledge and look down (if you want to, of course). Gloria loves doing adrenaline pumping things. I, on the other hand, am deathly afraid of a lot of things, heights being one of those fears. No hesitation when she walked out onto the ledge. As a matter of fact, she was jumping up and down on it to prove to me that it was safe for me to stand on it. I logically knew it was safe, but looking down, it was just too scary for me! Seriously, it made my knees weak just thinking about how high up we were. After much contemplation (and lots and lots of hesitation), I faced my fears and made the step out onto the ledge. I survived, obviously, haha! I am very proud of myself for doing something that I didn’t think I could do. …and because it was just around the corner, we walked North to see the Bean! To end our first day in the city, we had to eat at Giordano’s for the deep dish pizza. It’s like a staple food in Chicago, haha. We did get to see the Polar Bear, for only a brief minute though. It was way too hot and humid outside, so the zookeepers had to pull it into the backroom with a cooler climate. Later that evening, we hit up Navy Pier. I really wanted to see the view of the skyline at night, so we went on the ferris wheel. Again, I was scared to be up that high, but I did it anyway. Yup, that pretty much sums up my trip to Chicago. Oh, did I mention that I was born in Chicago?! I guess in a way, I was born a city girl. That glass ledge looks terrifying. You’re brave! That glass ledge looks crazy. I would have been scare witless also, but you couldn’t leave not doing it, if only for a second. Way to be brave. How fun!! LOVING the photos!! And you are braver than me … I could never step out on the ledge … I got the sweats just looking at your photo!! I haven’t been to the Skydeck yet, but will eventually. And the mere thought of Gloria jumping up & down (which by the way is an awesome pic) makes me want to vomit. You already know I share your fear of heights. Your pics are awesome!! Seriously… some of them could be postcards! Oh… and my hair stylist told me about The Purple Pig, but she wasn’t impressed at all. I haven’t been there yet. This post is making me want to go to Chicago right now!! Gorgeous pics! Chicago is on my Bucket List! Congrats on overcoming your fear of the glass ledge! I’m afraid of heights too! Don’t know if I could do it!